Susan Austad sculptures are the perfect blend of Earth science and art #ArtTuesday « Adafruit Industries – Makers, hackers, artists, designers and engineers! Nothing is permanent—especially not the ground on which we stand. 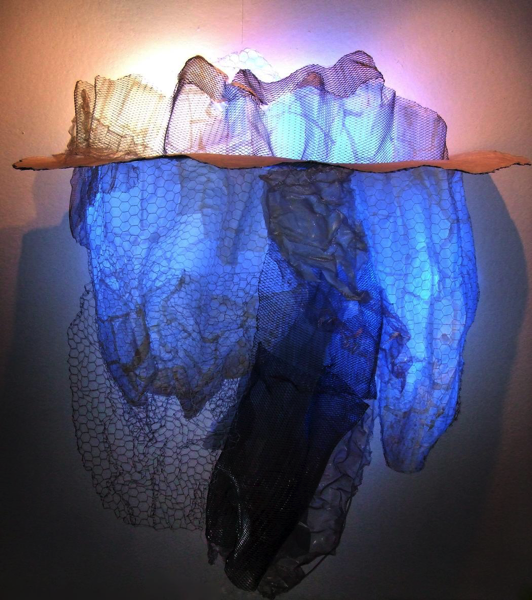 Susan Austad creates mesh sculptures that cast a keen and intelligent eye on the way that the earth changes around us. Whether she’s exploring volcanoes or glaciers, Austad’s illuminated sculptures shed light on the scientific principles behind our changing planet. ..
…For more earthly pieces, Austad says she thinks about how man has changed his landscape and how the landscape changes and adapts itself. “Icebergs calve off glaciers and they go into the water and they melt,” she says.